This summit is shared between Norway and Sweden. Highest along the Swedish-Norwegian border. How to get there: First travel to Sulitjelma, see the description under Suliskongen. Continue on the main road through town and follow signs for Jakobsbakken. The road leaves town and climbs the hill. Before you get to Jakobsbakken, there is a road that forks left and ends in a parking area near the place/hut called Skihytta. This fork is shortly after the main road has made a distinct bend to the right. Park in this parking area, this is the trailhead in winter (and spring). The elevation is 550 meter. 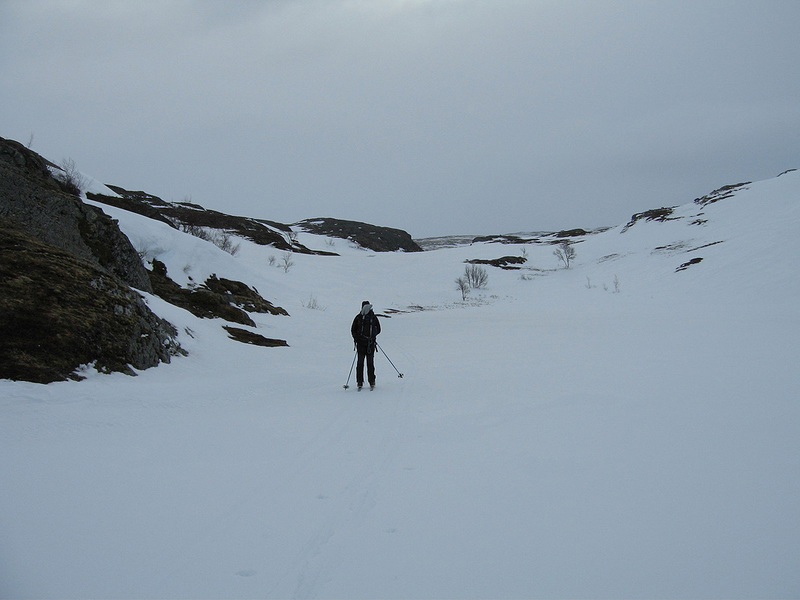 In summer, one can drive further south to Balvatnet and park only a few meter from the Čoarvi hut. 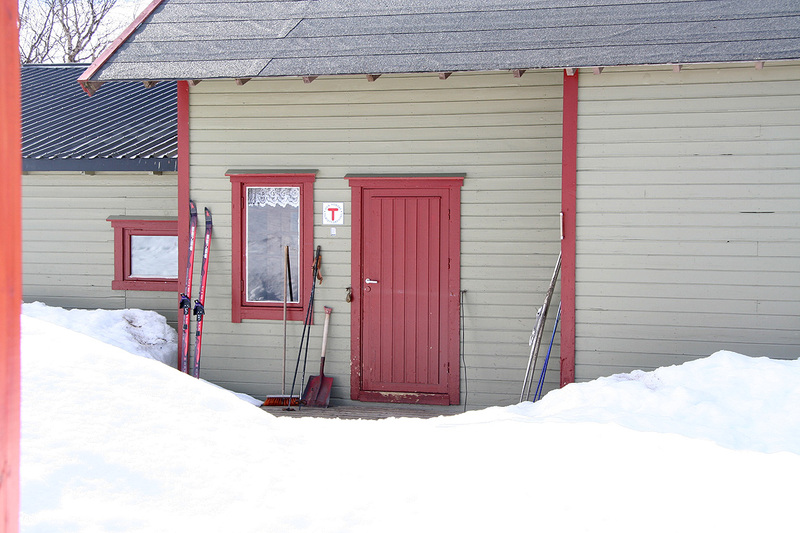 Route description: This description assumes that one will use the Čoarvi hut as a base for the climb. 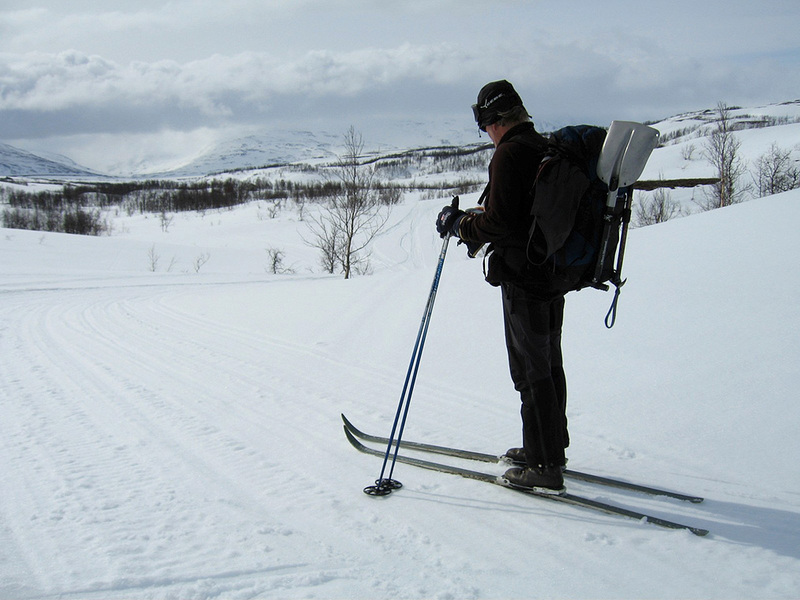 In order to get there, ski south along the road from the Skihytta. There are also tracks (from snowscooters) that often takes a slightly more direct course than the road. First, go uphill and across the small crest, then downhill to the lake Soahkejávrre (514m). Cross the lake and continue along the river until you cross a bigger river on the bridge. The route continues a bit more up in the hills while running parallel to a river on your west side. 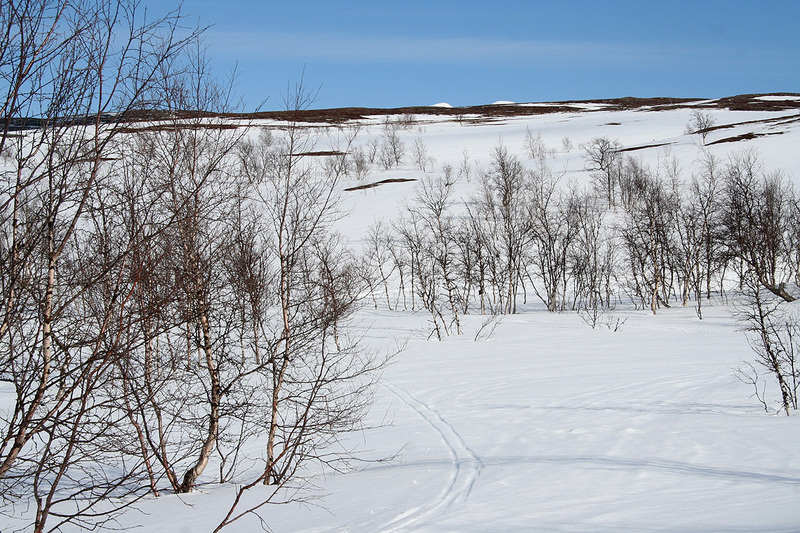 The Čoarvi hut is located to the left (east) of the road just as you reach the northern end of the lake Tjoarvvesivvun. The elevation here is 600 meter and the location is N66:59.690, E015:57.993. Next, in order to ski from the Čoarvi hut to Nord Saulo, head up the gentle slope towards the east, crossing a small lake (658m) and then up to a smaller lake at elevation 700 meter. From here, continue through the small pass south of the mountain Juhtar and descend on the east side. Contour south of Duolbbavárddo (868m) and ascend the next slope in order to gain the fairly distinct passage south of point 976. Cross the small lake and continue to lake (936m) just north of point 1011. 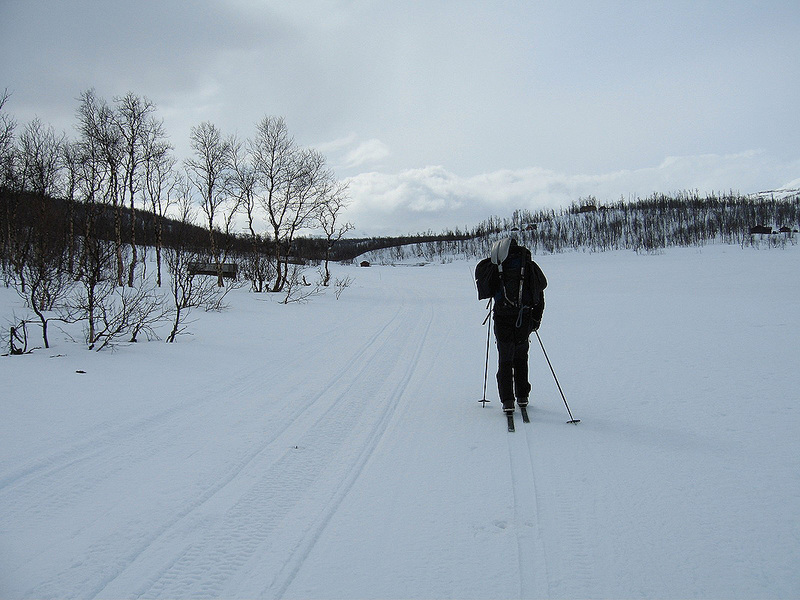 From here, the terrain is very nice for skiing as you continue across flat terrain to lake 901. Continue more east along a natural route just left of some small hills. This will get you to the base (N66:58.227, E016:10.514) of steep cliffs coming down from Nord Saulo, but with easy access to the saddle between the mountain and the smaller, sharp peak Ballek (1331m). Ski up to the saddle and turn north onto the broad south ridge. The location here is N66:58.150, E016:12.639 and the elevation a bit above 1200 meter. Continue up the ridge towards the steep cliffs higher up. Contour to the right side and continue uphill until reaching about 1700 meter of elevation. Traverse directly into the main saddle between the two peaks here. 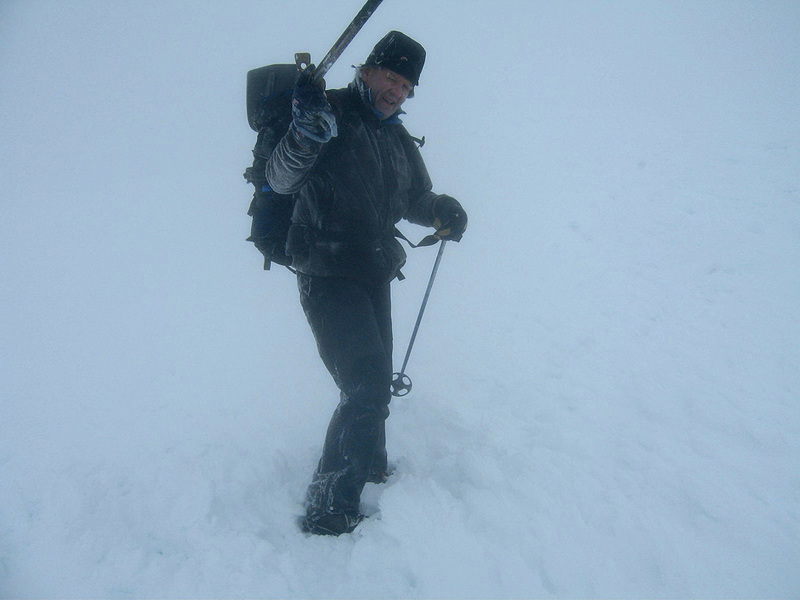 An ice axe may be useful for extra support and security. The south end of this main saddle has location N66:58.913, E016:11.578 and elevation of about 1713 meter. From here, it is an easy scramble to the summit of North Saulo (that is the south peak). 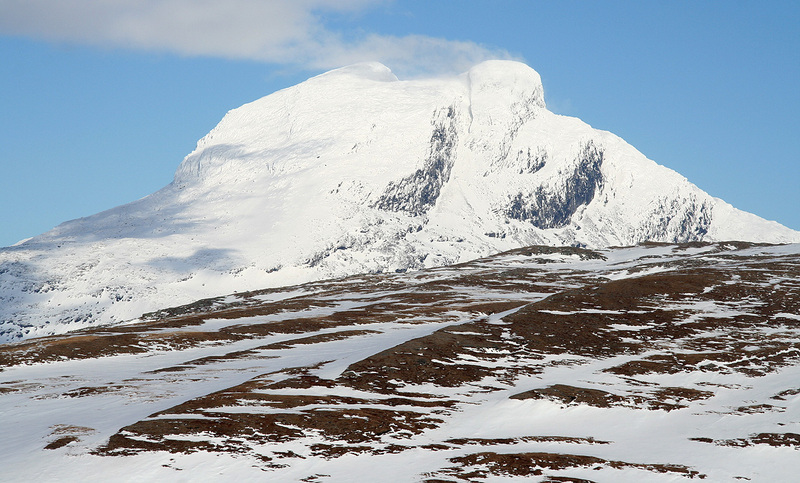 This mountain plays a central role along the Norwegian-Swedish border. 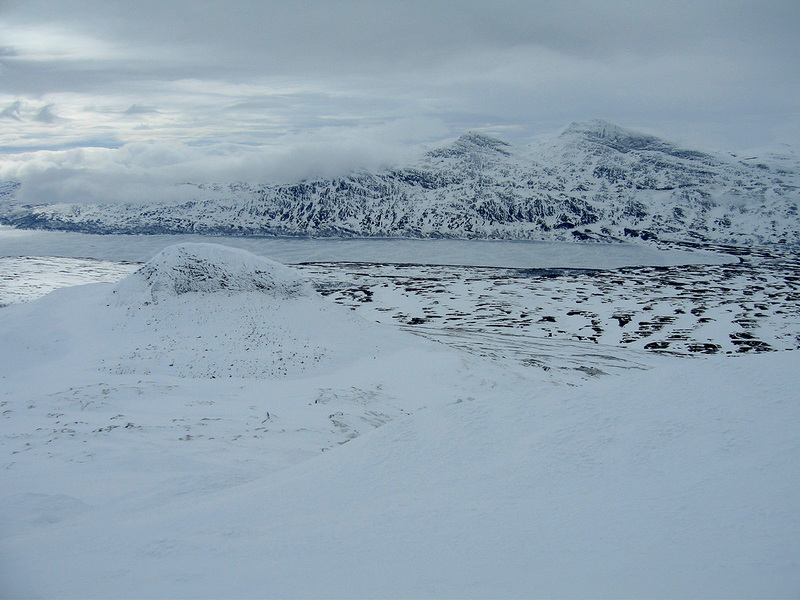 It is the highest point along the entire Norwegian border from the Skagerak to the Arctic Sea. Initially, I believed that the border line went straight through the summit point, however upon closer inspection of the maps, one observes that an official border marker, 236Aa is placed somewhat awkwardly high on the east slope from the main saddle between the two summits. A straight (border) line from here to the next border cairn, 236A, south of the mountain, will cross the summit plateau. 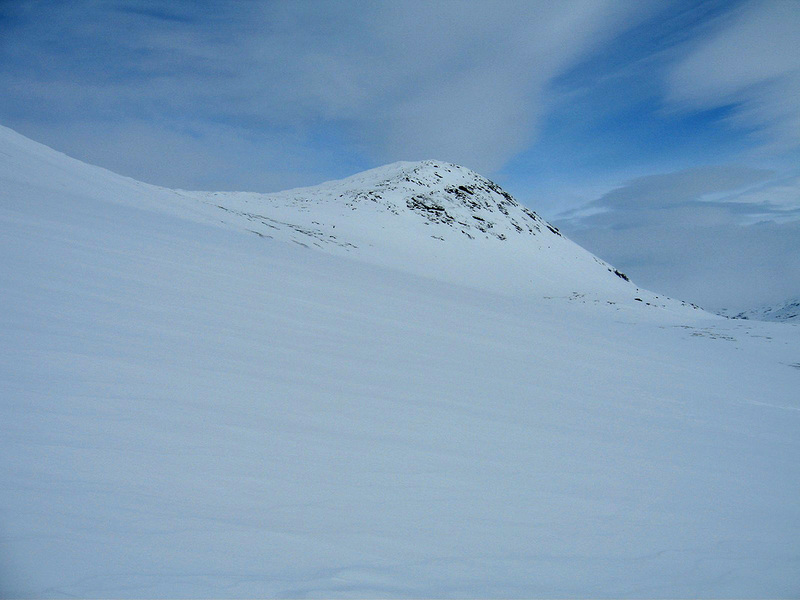 This summit plateau is relatively flat and it is a bit unclear where the highest point would be relative to the border line. Most likely, this is indeed in Sweden as the information below may suggest. Trond Espelund provided the following information: In 1986, a team checking the border looked for cairn 236Aa using a helicopter to get them onto Nord Saulo. They did not locate the marker. Later, it has been reported that this marker has been destroyed (by ice). There will be a new border check in 2010, at that time the 236Aa problem will be considered and (hopefully) resolved. Trond further reports that there is a Norwegian Benchmark (Trigpunkt) named L14T0051, with an elevation of 1768.2 meter. He does not know if it is located in Swedish territory, but assumes that this is the case. He further reports that the cairn is located at N66:58.849, E016:11.537 and that the top of the cairn is 1769.2 meter. 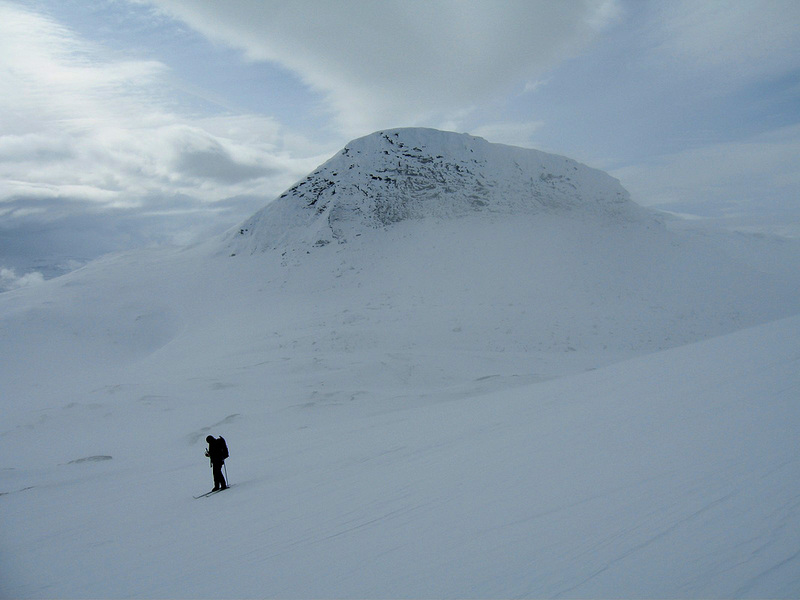 Our GPS track shows that we walked straight across the cairn area, it appeared flat and with a measurement of 1770 meter, the cairn was clearly buried under the snow. It is somewhat amusing (confusing?) that the position of the cairn is located on the Norwegian side of the border when refering to the Swedish (Garmin Mapsource) map, while it is located on the Swedish side of the border when refering to the corresponding Norwegian map. That is, when plotting the cairn coordinates as given above onto the two maps respectively. "...og endelig op for det høye field Nord Saulo, som er det 290de Rigsmærke, hvilket ikke allene bliver en uryggelig og sikker størke for linierne norden og søndenfor, men er desuden rundt om paa lang Vei kjendelig, saa som det ligger for sig selv allene uten at hænge sammen med noget andet field. Det er aldeles ubestigelig deels for Snee og Iis hvormed det paa adskillige steder, men mest paa den østre Side er bedækt, deels og for dets brathed og steilhed, saa at intet Røse derpaa kunde sættes; ovenpaa har det 2de meget høye topper eller Tioker i Nord og Sør beliggende imellom hvilke Rigspuncten er ansadt, som de terminerer liniernes strækning Sørefter til Skarjahagorri og nord efter til Røset no. 238 i Steendalen." The above quotation claims that this mountain is "unclimbable", that no cairn can be built on it. It further remarks that the mountain is very prominent as it is disconnected from all other mountains. I would certainly put my vote behind the very natural proposal to adjust the border in such a way that the official top cairn on the peak becomes a new and well defined border cairn. In this way, the two countries would share the highest point along their common border and thus also share a very prominent mountain. It seems utterly "clumsy" to have the border pass just a couple of meter away from such a very significant landmark. 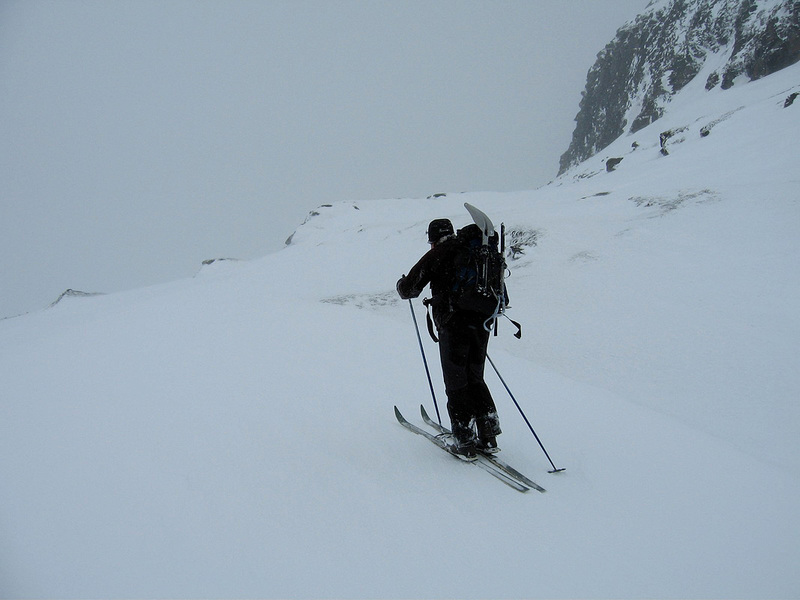 We started at 0730, skied across the south shoulder of Duolbbavárddo by mistake, thus gaining and subsequently loosing about 100 vertical meter, before hitting the route described above. It took us about 2.5 hours to reach the base of the mountain. Unfortunately, the weather had a low cloud cover and offered no opportunity to see the summit. Around 1100, we had reached the lower part of the south ridge, the visibility seemed to improve until we reached the upper slope, then took a turn for the worse. 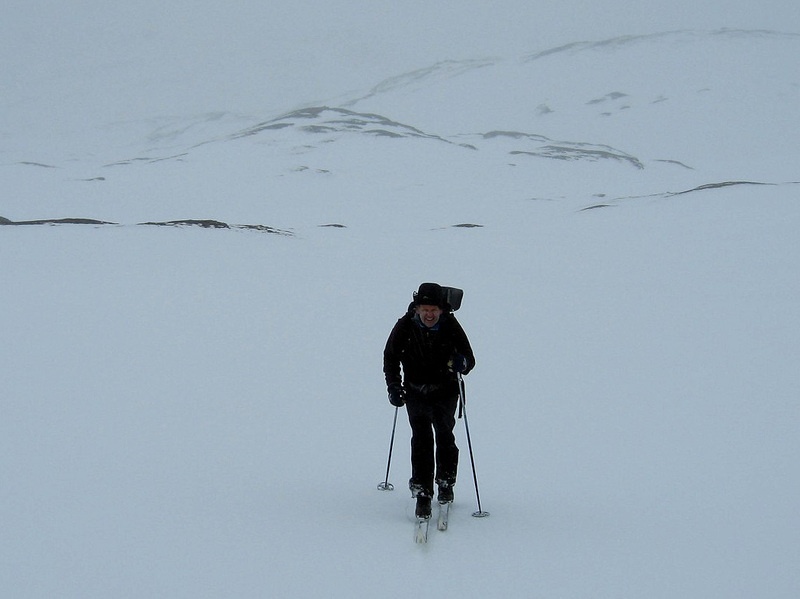 I traversed carefully into the saddle making good steps in the snow for Åke to follow. Soon thereafter we where on the summit, a pretty flat plateau. There was no cairn, clearly buried under the snow. We had total white-out conditions and some wind, the time was 1345. We walked around rather carefully, checking that we got a bit lower in all directions. GPS measurements were taken as well as a few photos. 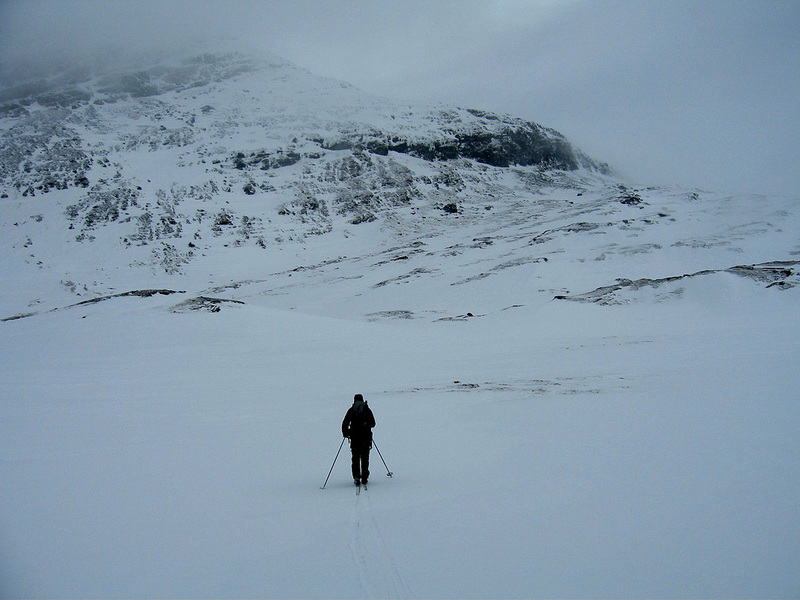 The GPS measured a few meter high consistent with a good snow cover hiding the cairn. (The cairn is only one meter high.) The highest point on the Norwegian border had been reached. After about 15 minutes we started back down. The return trip was uneventful, following the same route. We returned to the Čoarvi hut at 1715, a total trip time of 8:45. The next day, we set out to climb Årjep Saulo. View from the Čoarvi hut. The twin summits of Nord Saulo are barely visible. Nord Saulo as seen from Juhtar. 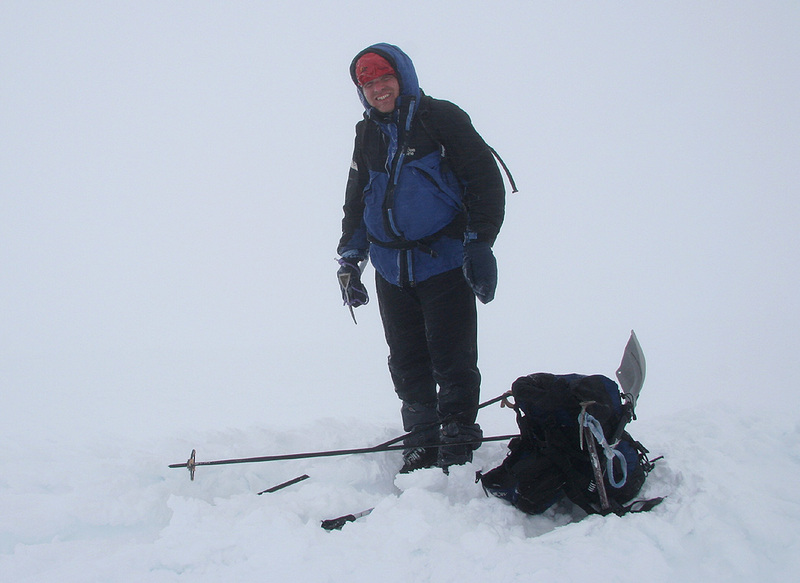 Summit picture, Geir Åke Dahlen is happy despite the total white-out.